A piece from Nicole Richie's jewelry collection House of Harlow 1960 has made an appearance in the star studded chick flick New York, I Love You. Actress Drea De Matteo is spotted wearing the House of Harlow 1960 horseshoe stack ring. The image isn't the clearest, but she is wearing it on her middle finger. 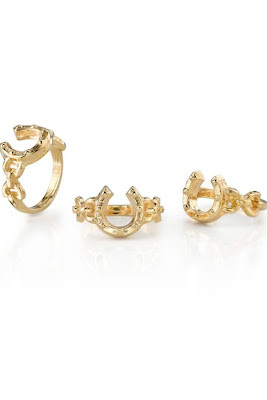 Shop the House of Harlow 1960 horseshoe stack ring for just $29! Thanks to Raissa for this spotting.